Cardi B performs onstage during the 2018 Global Citizen Festival: Be The Generation in Central Park on Sept. 29, 2018, in New York City. You can call Cardi B lots of things—stripper, ghetto bird, reality TV heaux—but what you’re not gonna do is question her mama credentials. 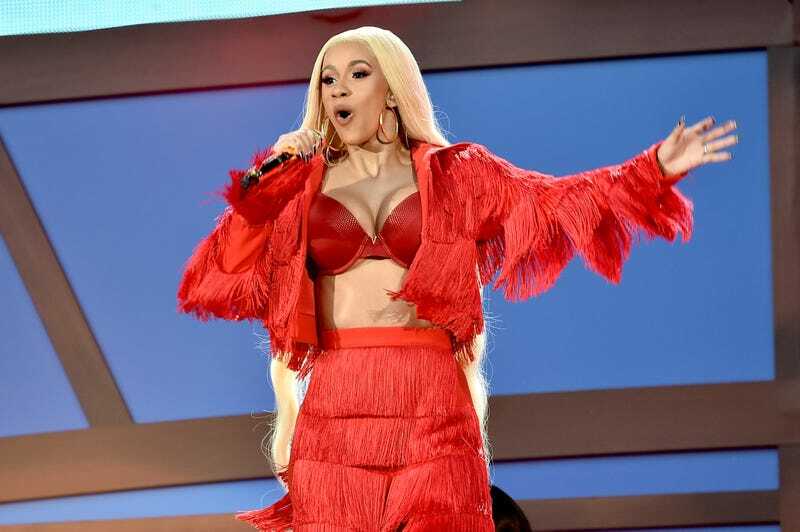 In a new cover interview with W magazine, Bartier Cardi (born Belcalis Almanzar) said that thing that brought her beef with Nicki Minaj to its boiling point (again) was Minaj’s cosign on a post that disparaged Cardi’s mothering skills. “For a while now she’s been taking a lot of shots at me,” Cardi said. “I spoke to her twice before, and we came to an understanding. But she kept it going. She’s not going to catch Nicki in the Whole Foods, okuuur? As been widely reported, Cardi got her face lumped up by Nicki’s bodyguards at the Harper’s Bazaar’s Icons party after coming for the Queens native’s neck. But in a searing riposte, Minaj recently released a line of merchandise with the words “Nicki Stopped My Bag” etched onto the pieces. That rag TMZ reports that Nicki and Cardi will both be at the American Music Awards tonight, so it’s either gonna be civil, or Cardi will get close enough to Nicki to make a connection this time. Or, they could keep it classy.